The election is only three days away and yet the outcome is still as unclear as ever. The only certainty is that we are heading, yet again for a hung parliament. No one party will command a majority in the House of Commons leading to long deliberations as to who should govern the United Kingdom for the next five years. The majority of political commentary in recent weeks and days has focused heavily on how potential coalitions will look; will there be a shade of blue and purple? Or will Ed Miliband renege on his bold promise by painting Westminster red and yellow? As interesting as it is to speculate the make-up of the House of Commons after Thursday’s vote, one voice is seemingly being ignored not only by the media, but by Mr Cameron and Mr Miliband. What the immanent eventuality of a hung parliament shows, is that our voting system is in dire need of reform. It is no greatly kept secret that the Liberal Democrats have been pushing for electoral reform since before their inception in the late 80s, we even had a referendum on it back in 2011! But the biggest parties are ignoring an ever louder voice that is crying for its views to be heard. To quote Nigel Farage, the ‘first-past-the-post system is bankrupt’; we need change. And we need it now. 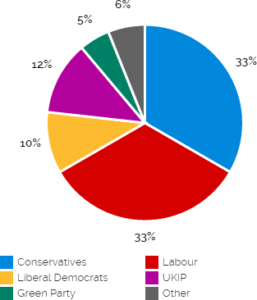 This chart shows which parties people in the United Kingdom, most sympathise with based on their policies. Users of the site are asked to choose which policies they most agree with, without knowing which party they come from. As you can see from the chart, the results are amazing. 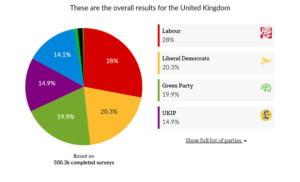 The majority of support is for centre-left politics from Labour, the Lib Dems and the Greens. 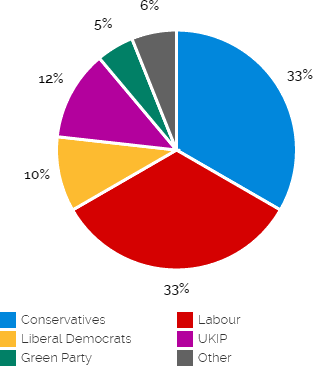 However, look at the chart that shows people’s voting intention for Thursday’s election; the results don’t match up! This is because our voting system is deeply and fundamentally flawed. People do not feel they can vote for what they believe in, more they have to choose to vote either tactically (to keep another party out of power), or they have to abstain or make a protest vote. People’s voices are not being heard and it is a mockery of our so-called democracy. When I delivered a lesson to my year nine class about the election, they asked what my thoughts were about the FPTP system. The easiest way to demonstrate my thoughts were to use the following example. Say if an election is decided by only four constituencies: A (100,000 voters), B (10,000 voters), C (10,000 voters) and D (25,000 voters). A votes Labour – one seat. B and C vote Conservative – two seats. D vote Liberal Democrat – one seat. Under the current system, the Conservatives are the clear winners because they have the most seats, but let’s look at what is actually the case. Only 20,000 people voted for the Conservatives, whereas 125,000 voted against a Tory government. Need I say anymore? Although a small-scale example, this is the picture across the whole of the United Kingdom. Two constituencies, one of 150,000 voters and the other of 2.5 million still only equal one seat. In as modern and forward thinking society as we in Britain claim to be, how on earth can this be the case? 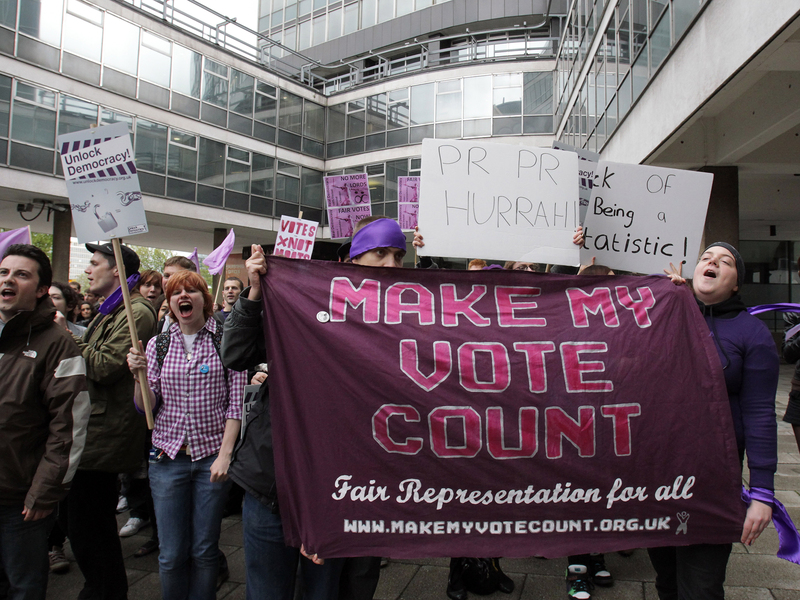 What is needed, is a system that allows for proportional representation. The Lib Dems’ proposed Single Transferable Vote system is a clear way in which every single voter in the United Kingdom can have their voice heard. It is disgraceful to think that when I go to the ballot box on Thursday in my constituency of Selby and Ainsty (currently a Conservative seat), that my vote for the Liberal Democrats will not count for a thing; it won’t be worth either the pencil I use to make my mark, or the paper I’m marking on. This is not democratic. This is not fair. This is not representative of the Britain I want to live in. Under an STV system, the 2010 election would have looked significantly different. Smaller parties would be granted a larger presence in Westminster as support for them would be fairly represented across the country. In 2010, the Liberal Democrats lost parliamentary seats despite having a higher share of the vote than in recent years! It is simply ludicrous. The Tories and Labour know that if PR were introduced, then their iron grip on Westminster that keeps Britain bouncing between the left and the right would end. Parties like the Lib Dems, the Greens and even UKIP would be able to have more of a say on the governance of our great country. “But what if far-right parties like the BNP gain seats?” I hear you ask. That’s democracy. If the people vote for it, then they have the right to have their views represented. The introduction of PR through the STV system would put an end to hung parliaments as parties would be either be forced into coalition governments – which, are the way forward for British politics – or a winner would be undeniably obvious! A recent survey carried out by The Independent shows that 61% of people asked are in favour of voting reform. More than half. The figure is there in plain black and white. The Scottish National Party has pledged it commitment to voting reform (ironic considering they could 46 seats with only 4% of the national vote); the case is now stronger than ever. The voices of the British people needs to be heard. First-Past-the-Post was designed for a two party system. We no longer have a two party system. We have a wide spectrum of political parties that represent a variety of different views, and every single one of them needs to be acknowledged fairly in the House of Commons. The Liberal Democrats are the only party to be fully committed to reforming our broken and unjust system. I would urge you to vote for them on Thursday, but even if you did, it wouldn’t make the blindest bit of difference.